Someone remind me that I wanted to make a post about Rise of the Guardians and childhood dreams. I really meant to, but time slipped away from me, as it often does. In fact, some of you might notice that this went up after midnight eastern standard time, which actually makes it a Saturday Four. Anyone who speaks up about this will be kept after class and made to write “I will not question people in their own blogs” a hundred times. And I want that handwriting neat! I was in a bit of a conundrum over what to make the first Friday Four about. I have spent the last two days trying to pull together stuff to talk about for our 2012 reviews at the Wrong Opinions Podcast. (Well, when I wasn’t trying to figure out how to warp one of the Big Damn Existential Scifi Novel characters into something I could write for a call). I’ve also spent a lot of that time feeling sad that I couldn’t talk about We Need to Talk About Kevin on the podcast this evening because it came out last year. Then, finally as so rarely happens, the two separate sides of my brain connected somehow and I realized I should make the first Friday Four about movies I watched last year and couldn’t talk about on the review podcast. So here, in no particular order, are four movies you should definitely watch if you missed them the first time around. Before I begin this, I need to warn you that this movie will never let you go. It’s brutal and effective in its attempts to force the main character’s unease on to you. I watched it many months ago and yet I was just last month in the middle of a long car trip when all of a sudden out of nowhere I was struck by the immense sadness of the ending of the movie and couldn’t breathe for a moment. The story is that of a mother’s (Tilda Swinton) frustrations over her inability to understand and form a relationship with her son (played at different ages by Jasper Newell and Ezra Miller) and her husband’s (John C. Reilly) inability to listen to what she’s really saying when she talks about her fears. The whole thing culminates in a school shooting, but it’s not really the end that sticks with me as much as all of the build up. 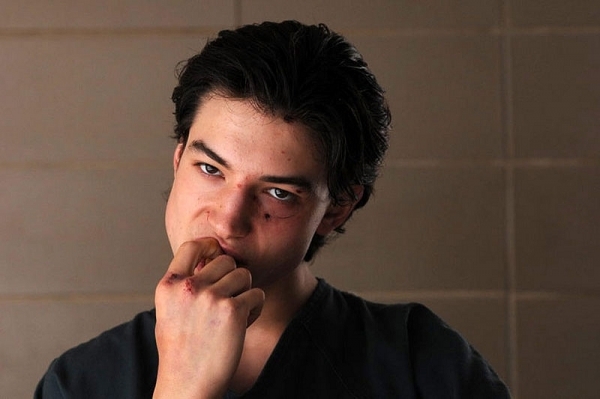 Ezra Miller and Tilda Swinton turn in outstanding performances. Miller’s performance in particular haunted me for days after I watched it. (And then gave me some wicked whiplash when later that weekend I went and saw him The Perks of Being a Wallflower. He’s one to watch. )The friend who recced the movie to me told me she wished she could forget having watched it, it’s so disturbing. I wouldn’t go so far as to say that it’s a horror film, but a lot of the elements of suspense are there. It grabs you by the throat and doesn’t let go. If you like deft character development, scripts that don’t mince words, and aren’t afraid to get your hands (or your imagination) dirty, then this movie is for you. This is one we did discuss on the podcast, as part of our Hitchcock Extravaganza at the beginning of last year, but I will never be tired of trying to force people to watch it. The Lodger is a silent film about a murderer who is loosely like Jack the Ripper in the way he carries out his crimes and who he targets. It mainly concerns a man who takes a set of rooms during this turbulent time (Ivor Novello) and the daughter of his landlords (June Tripp) whom he falls in love with. This movie had my undivided attention about five minutes in when it gave me some awesome shots of the room sized newspaper printing presses of the time…and then Ivor Novello happened. I think maybe you need to have been raised on Lon Chaney and Boris Karloff like I was to understand how such an expressive face and entreating eyes can capture my heart so, but I fell fast and hard for our hero. …or is he? He’s mistaken for the killer and then cleared after a harrowing mob scene, but you can’t be sure. The movie itself has the normal narrative snags that we often find when we watch movies structured for audiences of a different time, but you can see Hitchcock’s developing style in it. Especially in the very last scene where all of the intent of clearing the lodger’s name that was in the script–Novello was a popular actor and they couldn’t sully his name by having him play a murderer–is undermined entirely by Hitchcock lingering on a particular lit up sign. If you like the brand of suspense found in silent films or learning about where famous directors got their starts, then this movie is for you. I wanted so badly to see this film that I almost broke my keyboard ordering it on Netflix when it finally showed up there. I knew absolutely nothing about it except what I’d seen in the trailer at the beginning of 2011, but that was enough. This movie was so much more than I expected it to be. I thought it might be your average coming of age lesbian tale with enough cultural differences to keep me intrigued. I did not expect to see the harsh realities of living as a young person of suspect in Tehran, how the things that a person does can get back to their families in a hundred painful ways, or the strength of rebellious spirit in a growing class of young people who refuse to live in the world their parents have left for them. I cannot deny that I take a lot of things for granted about my life, and watching things like this kicks me outside of my head, which is a good thing. The girls (Nikohl Boosheri and Sarah Kazemy) in the movie give engaging performances, and their group of friends made me smile as often as they made me think. There’s also an incredibly creepy plot with one of the girls’ older brother (Reza Sixo Safai) and his obsession with her girlfriend that was way left field from what I was expecting, So good job, movie. If you are interested in LGBT youth or stories about coming of age in Iran, then this is the movie for you. Billed as Fantastic Planet in the US, La planete sauvage is a feature length animated film written by René Laloux and Roland Topor, and animated at Jiří Trnka Studio. It reminds me a great deal of many things, but I feel like all of those comparisons would be unfair because of the cultural differences between where I’m coming from and where this coming from. Though, that isn’t to say that those things I’m thinking of weren’t influenced by this or other works by the studio. The main action of the story concerns itself with a human boy named Terr who is being kept as a pet by one of a race of gargantuan blue aliens called Draags. The aliens believe humans too stupid to learn, so Terr passes his many bored hours by listening to his owner’s school lessons. When he finally manages to escape and find more people like himself his knowledge of the alien race helps the other humans (referred to as Oms, a term too close to the French word homme for me to ignore) fight back in a way they hadn’t been able to before. The ‘camera’ here lingers long and heavy on the surreal landscape of the Draag planet and its many strange and wondrous creatures who seem to enjoy capturing and taunting or torturing smaller animals for fun. It’s this behavior that probably informs the Draags opinions of the Oms as unfeeling beasts, but in the end a shared reason saves the day. If you like speculative science fiction, existentialism, surrealist art, or listening to people speak French (look, I’m easy for French), then this movie is for you. And that’s enough of that for one night, as it’s now way past my bedtime. Is there a movie you’ve been dying to tell someone about or that you think I should see? Share in the comments! And have a good weekend.